Happy Halloween everybody! What better way to celebrate than with those few who don costumes every day of the year...the heroes and villains of the DC Universe! Let's see what we have this week! Superman #13 - "I am NOT the only one who believes in the power of the press--The fact that we need to stand up for the truth." The new creative team for Superman takes over this issue to bring us a prelude to the SUPER cross-over "H'El on Earth" wherein Superman bench presses the planet, quits his job at the Daily Planet and is forced to fight a gigantic 2-headed dragon! Oh, and he walks in on Jimmy Olsen and an...ahem..."guest" in the shower. Writer Scott Lobdell and artist Ken Rocafort (you might know them from Red Hood and the Outlaws) get a crack at the man of steel and they DO NOT disappoint. 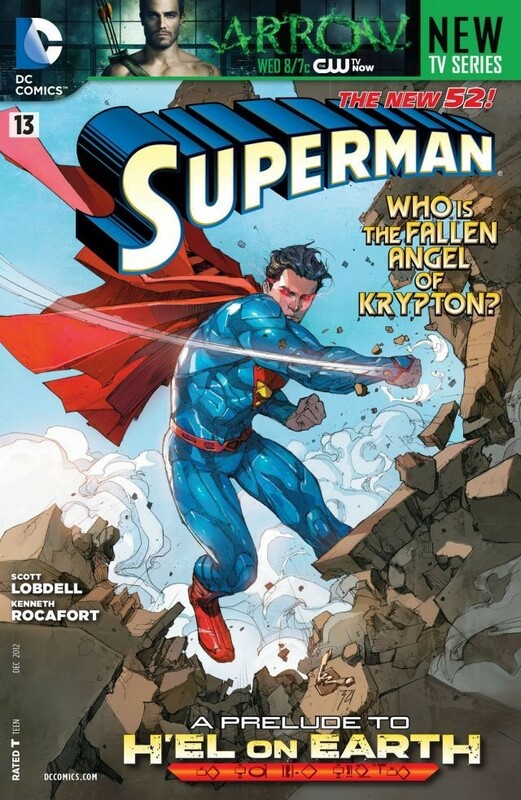 The book is beautiful, the characterization is spot on..this is arguably the BEST issue of Superman since the New 52 began! If you only buy ONE comic a month, make it Batman. But if you buy TWO? This is a really, really strong contender! Kudos! Speaking of Batman, we've got Batman, Inc, The Flash, Teen Titans and more after the JUMP! 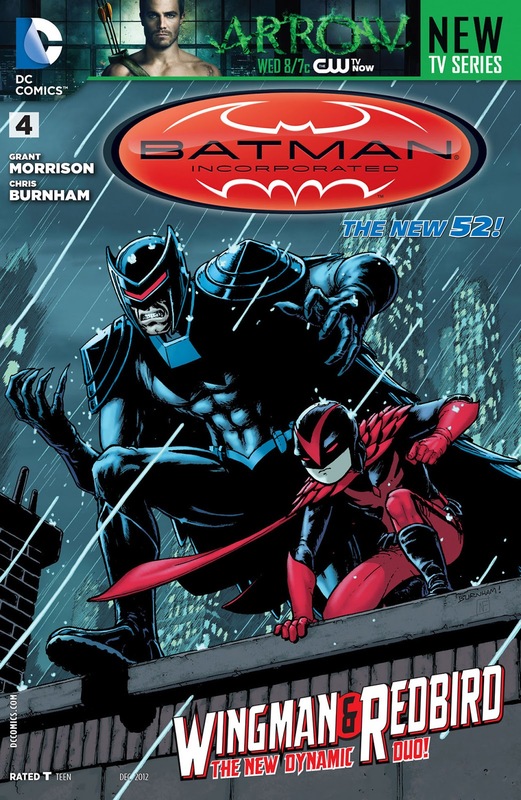 Batman Incorporated #4 - "Batman, Incorporated versus thirty of the world's greatest assassins. In a confined space. No one in, no one out until we're done." Batman, in his guise as Matches Malone, allowed himself to be caught in a trap last issue in his attempt to take down Leviathan and save Gotham! Now, the trap is sprung! The only question is, is it the heroes or is it the villains that are caught?? One little explosion later, and Nightwing, Red Robin, Knight and Squire, etc...basically ALL of Batman, Inc. arrive to join in the fun! Oh wait...there IS another question. Batman put a guy he called "Wingman" in charge of everyone. Damian "Robin" Wayne is SURE he knows that guy from somewhere...so the question is, who is Wingman??? You don't have to look too far for the answer...read the book and you'll find out! Not only that, but some startling news on the future of Damian! What is Bruce doing? The Flash #13 - "I'm already up to my neck in supercharged Rogues and Dr. Elias' treachery...not exactly the ideal time for a full-scale Gorilla City invasion. Just saying." The action never stops when you're the Flash! Barry's epic battle with the newly super-powered Rogues is interrupted when hundreds of giant talking gorillas literally fall from the sky! This is actually pretty good timing for the Flash, as he was unconscious and at the mercy of the aforementioned Rogues when the Monkeys hit the fan. It's amazing how quickly your worst enemies will assist you in regaining consciousness when they need you to help hold off a Gorilla army!! Incidentally, I couldn't believe what happens to the Trickster in this issue! He isn't wanted by the Rogues and so he tries to befriend the apes. Idiot. 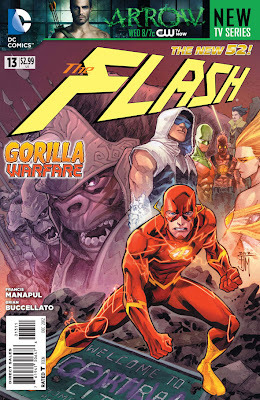 Gorilla Grodd quickly shows him the error of his ways in a MOST convincing and SHOCKING fashion! Talon #1 - "The Court of Owls was uncovered and defeated, and I saw the possibility of true freedom dangling in front of me." 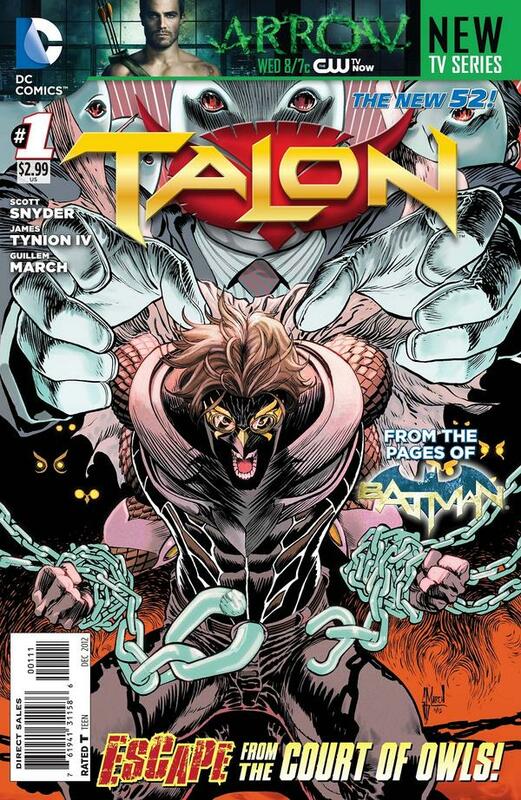 The number 1 issue of Talon debuts this month! It's not really the first issue, as the series started last month with a Zero issue, but it's the first set in modern day Gotham City! We join Calvin Rose, the titular Talon, as he literally drops back into Gotham for the first time since making his escape from the Court of Owls. He read about Night of the Owls (See Batman #1-12 or so) in the newspapers and had to see for himself. Could the Court be...gone?!? Calvin quickly learns what we already know. The Court isn't GONE, but it's...let's say...WEAKENED. Perhaps weakened enough for a resourceful former Talon to take down for good! Particularly if he has a little help...maybe from another victim of the court...an older man with some resources and some computer skills and some knowledge Calvin can use. Someone like Sebastian Clark! He's an enigmatic but seemingly brilliant guy, and he's determined to come to Calvin's aid! Together, they hope to strike the death blow to the insidious Court of Owls!! Teen Titans #13 - "The mask screamed--it attacked me! I should have been terrified, but instead...I laughed..."
Well, of course the Titans are going to have to confront the newly powered up Diesel...NEXT MONTH. For now, it's off to Cambodia to try and learn more about the armour by investigating the dig site where it first appeared! 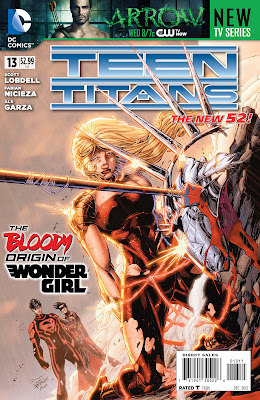 We also get a teaser cameo of Amanda Waller this issue! She's still interested in the Titans and has decided it's time to meet. To that end, she's sending Kurt Lance (whom you might know as the supposedly dead husband of Black Canary) to bring them to her...alive, preferably. 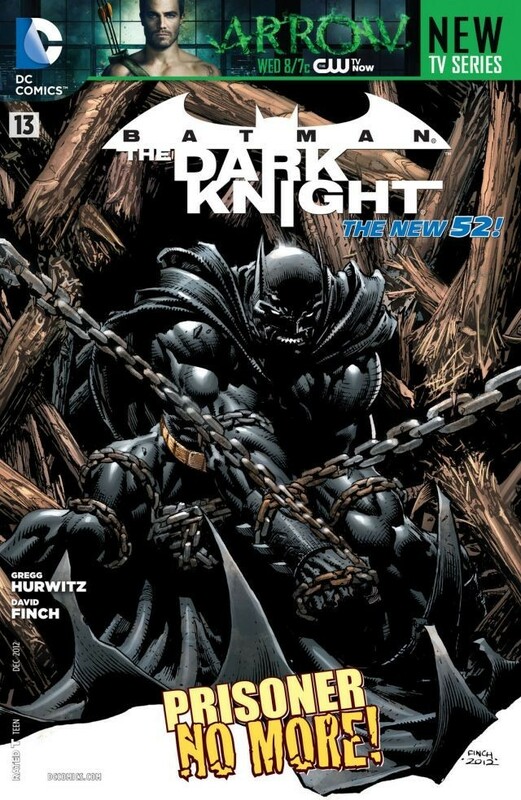 Batman The Dark Knight #13 - "You bring darkness, Batman. You conjure it. Me? I just hold up the mirror." 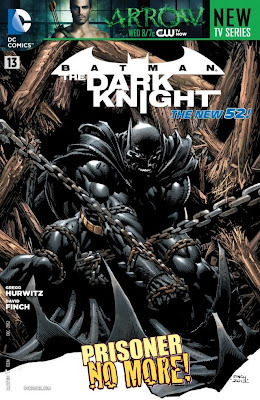 Batman is physically still tied to a table in Scarecrow's lair as this issue opens. We continue our voyage deep into the troubled, tortured minds of both our hero and our antagonist. Author Gregg Hurwitz has really turned this book around with a story both fascinating and troubling. There's no way that I can really do it any justice with a quick paragraph, except to say that I learned something about both Bruce Wayne and Jonathan Crane. They aren't nearly as different as Batman might like. There is at least ONE important difference though. Scarecrow is holding a little girl hostage to experiment on. Batman is there to stop him. Period. So once again I've finished all of my comic books for the week! Not to worry, though as tomorrow is another New Comic Book Day!! Being the 5th one this month, there aren't nearly as many titles coming out, but we can look forward to Action Comics Annual #1, Batgirl Annual #1 and my final issue #13, Aquaman! As always, I rambled on about something or other over at Stryder's Dementia this week! I've also been updating My YouTube Channel less sporadically lately...check it out if you've got a moment! So that's it! Stay safe this Halloween and scare someone for me! Peace out!